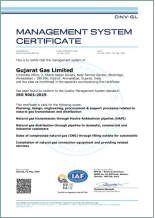 Gujarat Gas Limited (formerly known as GSPC Distribution Networks Limited), is India's largest city gas distribution player with presence spread across 23 Districts in the State of Gujarat including the newly awarded Geographical Area (GA) of Narmada (Rajpipla) District and Union Territory of Dadra Nagar Haveli and Thane GA which includes Palghar District of Maharashtra. The company has India's largest customer base in Residential, Commercial and Industrial segments. 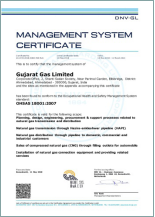 Gujarat Gas Limited is committed to reach out to every possible natural gas user in its expanded GA. The size and scale of the combined entity gives it the ability to achieve efficiencies and effectively manage the transformational changes in the sector. This major gain in productivity would benefit all the key stakeholders, i.e. Customers and Shareholders. The company has around 22,200 km of gas pipeline network. It has 309 CNG stations and provides close to 5.0 mmscmd of Natural Gas to over 13 Lakh households, approximately 1.87 lakh vehicles (serving per day) and to 3421 industrial customers. Gujarat Gas Limited is strategically aligned to energize India's natural gas vision. Gujarat Gas Limited has received ISO 9001:2015 certification, the world’s most recognized quality management standard. The certification was awarded by M/s DNV GL on 11th May 2018. An ISO 9001 certification demonstrates that the quality management system of the organization has been measured against the standard and found compliant. Issued by a third party certification body, the certificate demonstrates our commitment to quality management and customer satisfaction which is one step closer to building a sustainable business performance.